Starting out as a self taught hobbyist woodworker at age 14 in 1994, Chris Vesper began making some tools for personal use after school hours, and was inspired to improve on quality or design of tools available at the time. The hard won self taught woodworking experience gave Chris the exceptional ability to design tools that above all else will function the best in the world while the pleasing aesthetics can be considered a welcome bonus. 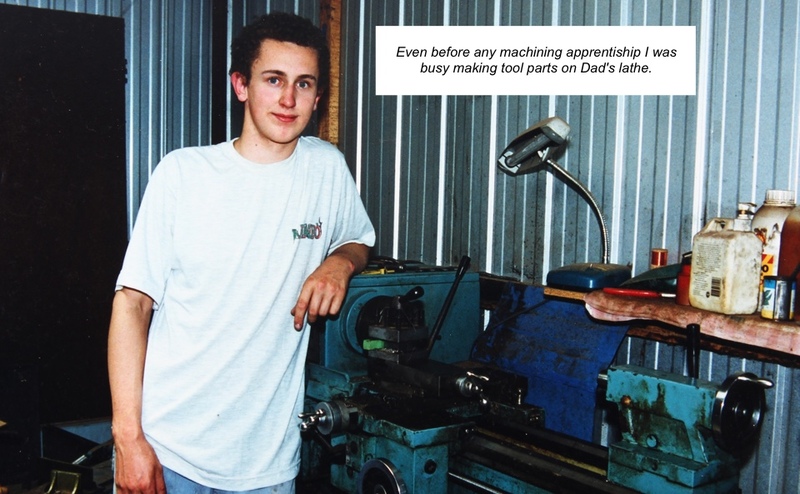 After humble beginnings in 1998 selling his first production tools Chris went on to full time toolmaking in Sept 2003. 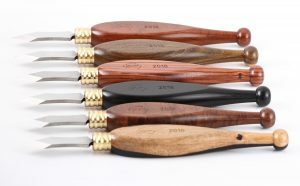 Since then Vesper Tools has earned a reputation for quality tools second to none with mutual respect from peers and publishers and woodworking notables around the globe and now exports his hand made quality all over the world. Celebrating 20 years of making and selling the best possible woodworking hand tools in 2018 is no small achievement for one maker. I welcome you to the amazing quality of Vesper Tools. My tools represents all I have learned in my self taught toolmaking career to date. I have poured my heart and soul into trying to make the BEST tools available anywhere in the world. And I know after years of experience and research that no others will come anywhere near this level of value and quality. 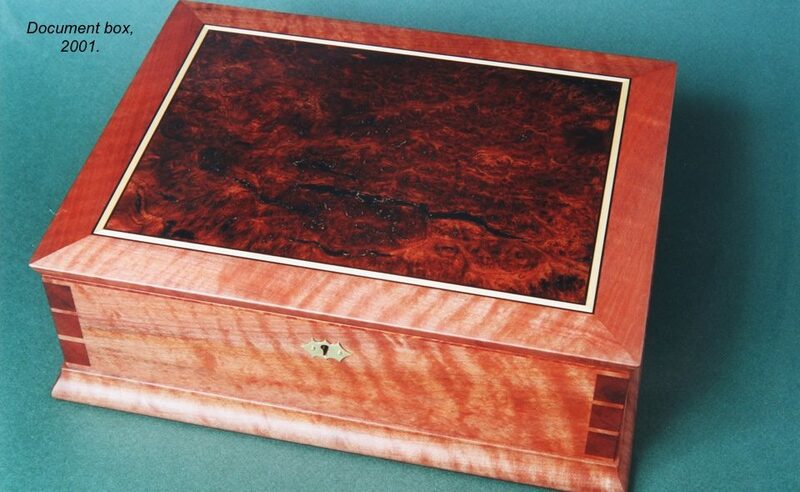 Dovetailing the Queen Anne tallboy carcase, 1995. Chris Vesper developed a passion for fine woodwork after discovering the aromatic scents and warm glow of timber, soft wood shavings and the lure of big machines in the high school woodworking department. He took it upon himself to self-learn traditional woodworking, mostly from books but also any older craftsmen or hobbyists he could soak up any info. Learning about timber, cutting it, drying it, tree species, etc all started early. 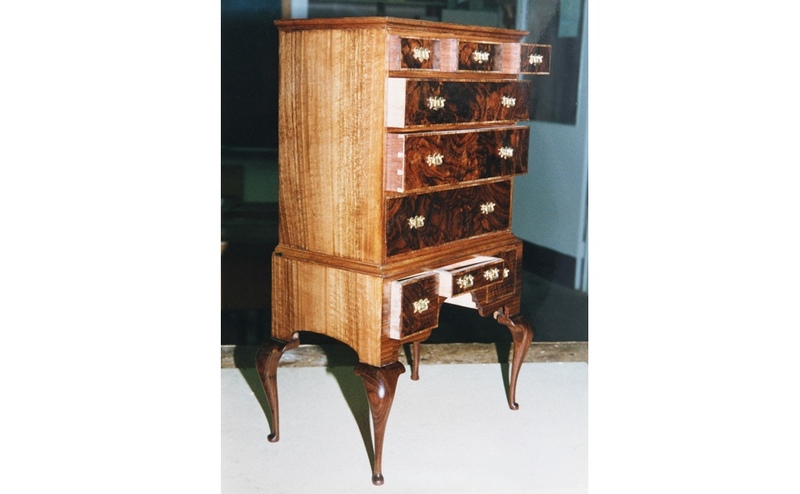 There was no family influence in taking up woodworking but more a strong personal desire to do so and do it well. At the age of 15 he started building his first real project: an ‘Apprentice Piece’, a scale model of a Queen Anne Tallboy about 24” tall. Designed and proportioned completely from a small sketch in a book, the three dimensional proportions including cabriole legs were worked to perfection on his manual drawing machine he owns and uses to this day. This tallboy is hide glue veneered in Euro Walnut and using as much traditional joinery including hand cut dovetails as to be expected. 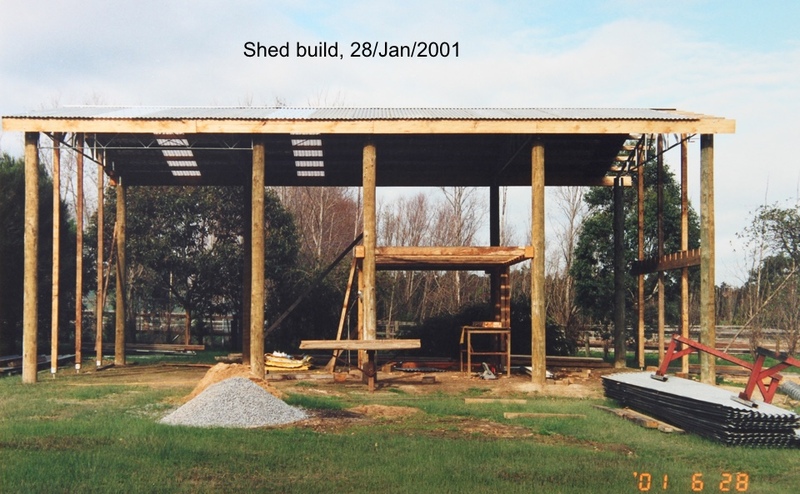 It took approx 18 months to build using school time and weekends using what little hand tools (crude by today’s standards) were available. 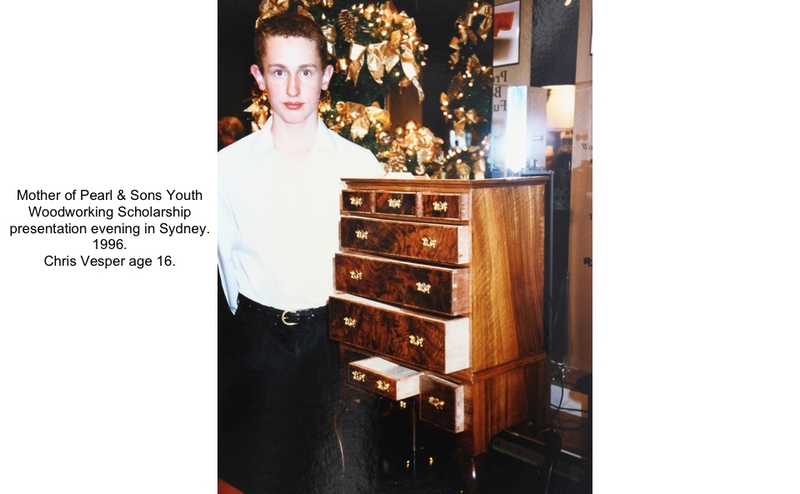 When finally finished he entered it in the Mother of Pearl & Sons Youth Woodworking Scholarship in Sydney in 1996. He did not win, but the experience of building the piece was the beginning of a life long journey to self-learn to a high art and follows through in many aspects of Chris’s life. To become an artificer it seems was the inevitable path in life for Chris. Whilst woodworking at school age with no income there were many tools required but unable to be purchased. From these difficult beginnings with poor quality tools some lessons were learned about things like blade steel quality, sharpening, accuracy, and getting what you pay for. Chris made some tools as best as he could, improving upon those in the market in those early days. There were all sorts of things drawn up and one offs made, patterns and castings made, some finished, many not. Including an infilled toothing plane (well why not?! ), a bronze router plane, several shoulder planes, honing guide, mallets, dovetail gauge, sliding bevels, panel plane, mortise gauge, and more. Some of these tools were made and sold in very low quantity. And most successful of all at the time was a Cutting Gauge of unique design made at the age of 17, it was entered in the Royal Melbourne Show in the student section and won a first prize. 1998. With some prompting from some folks Chris made several more cutting gauges in 1998 and took the Friday off school and caught the train to the big smoke with a cardboard box of tools under his arm where it had been arranged that a small corner of a display cabinet be made available on the Baileys Toolbank stand at the Melbourne Timber & Working With Wood Show. Perhaps spending more than he earned on tool sales on the amazing timbers and tools on offer across the show it was a very small and humble beginning. Some of the customers from that very first show are still in contact and still customers. The next year followed on with some dovetail gauges and carving/marking knives plus a mortise gauge and more cutting and marking gauges of the old design. No tools were marked with a makers stamp until around 2003 when Chris took on woodwork tool making as a full time pursuit. 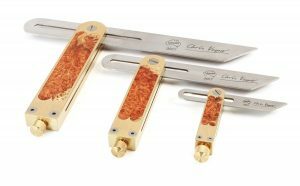 Based off this early woodworking experience Chris had the fundamental knowledge that accurate marking and measuring is the basis of good work, to this day this experience forms the basis of the drive and passion to create the best measuring and marking tools possible for your enjoyment. The irony of the humble and poor beginnings in the tool world and now making high end tools is not lost on Chris, but it is the way it is meant to be. Chris offers a 10% discount to full time woodwork students anywhere as encouragement to get the best from the start if possible. 2003. 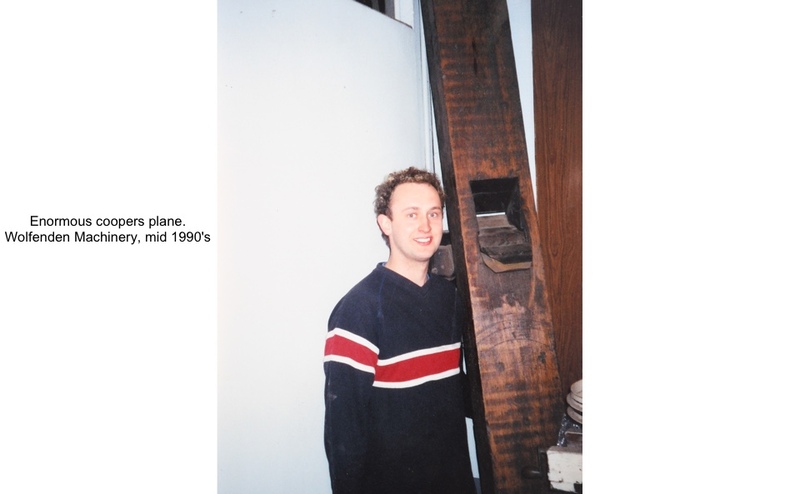 After completing high school Chris continued as a hobby woodworker whilst beginning a Fitting and Turning apprenticeship, this was abandoned for various reasons after 2 out of the required 4 years and never completed. A job in woodworking was taken but that didn’t last long as the desire to make higher end solid timber furniture was too strong for that operator so it was back into the machining game for a while. One way or another back then without true satisfaction in working for others 5 years passed from Jan 1999 to Sept 2003 after which he decided to have a go at full time self employment trading as Chris Vesper Tools. It was then the CV in Australia logo was first coined. The only reason this was commercially possible was by having a 140sq/m double story workshop he had built himself on his parent’s property with token rent to pay. Equipment was very basic and a gravel floor was the beginnings there. Most wages to this point had been put right back into the workshop build, or old machines and tools that could be found and repaired. 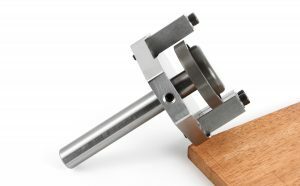 The first job in 2003 was to re-design the old style of cutting gauge to the current design with locking knob on top of a unique and ergonomically shaped gauge head. The old design was a labor of love requiring much time and sore fingers from the hand sanding and shaping to make the extremely unique head design. The reality of having to modify the shape to streamline production in the new venture was apparent early on. The early couple of years were very difficult as the decision to go into business had been taken with a headstrong desire to do what one wanted in life, not to become rich and famous. With no training on accounting skills, no marketing knowledge, no knowledge of branding, no stock control, no scheduling and no business management skills. Hindsight is a wonderful thing. 2007. Slowly and with much personal sacrifice the workshop equipment was slowly improved and made more efficient, product range was expanded and evolved in steps, marketing was grown, sales grew, woodworking shows of various kinds all over Australia were attended. Sliding bevels with a low profile side locking knob were introduced around 2002-2003. Sliding Bevels then evolved into one of the flagship products for Vesper Tools from 2007 after changing to the current flush locking design still available today and proven worldwide as simply the best bevels available bar none. This design was inspired by the Isaiah J Robinson patent of 1876. 2008. A significant moment in the Vesper history was October 2008: Barely 1 month after the GFC smashed global economics, the AUD/USD FX rate was in the toilet – Chris’s first overseas journey to the USA where he attended the inaugural Woodworking In America event in Berea KY as an exhibitor with the freshly developed sliding bevels on offer. This was an eye opening experience and was an opportunity to meet people and peers in the industry that are still valued and considered friends many years later. Chris still travels yearly to the USA for various woodworking hand tool related events and conferences. 2009. Chris re-branded the business to Vesper Tools. This required a new stamp to be made for branding tools and the old ‘CV within Australia outline’ stamp was retired in June 2009. 2010. A quality, accurate and functional try square in the market was of course next logical step to complete the essential layout tool range from Vesper Tools after persistent prodding from customers the squares began. Designed with similarities to the very successful sliding bevels with infilled bodies and stainless steel blades they were a success also with many orders taken off the prototypes for the first production batch which was sold out. The design and development for these began in 2010, and took around 3 years to complete by developing new production techniques and work flow and tooling to make these squares efficiently. This time included the split second of inspiration required to invent the unique Support Tab in all Vesper Try Square and then the nearly 18 months it took from that second onwards to prototype many versions and develop the idea to the point of fulfilling mounting back orders. Over time as orders grew a limiting factor of the business became apparent – Chris himself is that limit as there is only so many hours in a day to get tools made. Some of the early products dropped off the radar over time as the bevels and squares became the more desired products. 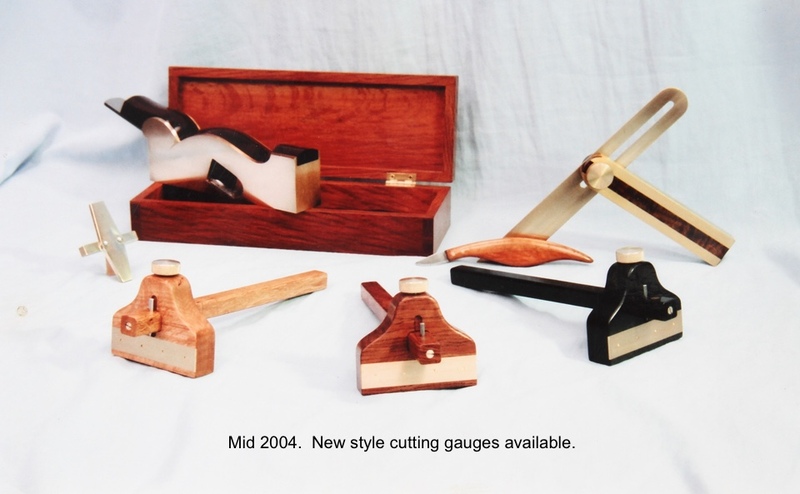 Dovetail Gauges have been discontinued. Marking and cutting gauges have not been officially discontinued but are not available until the never ending production backlog clears and time is found to return to these. 2013. 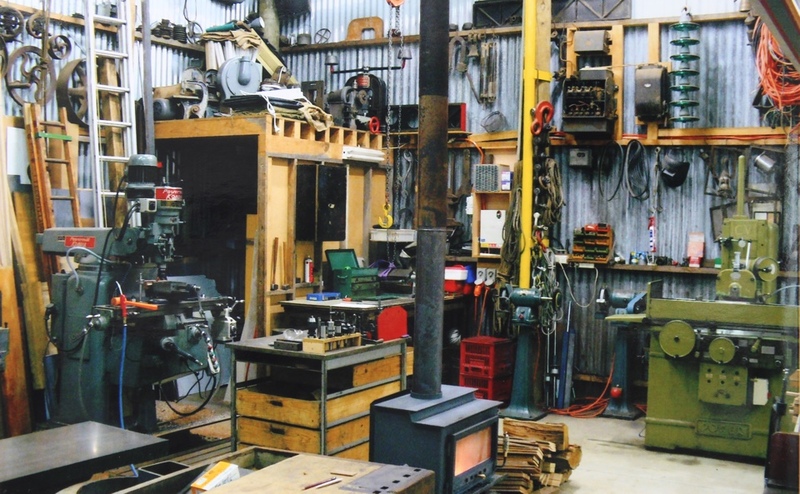 Through 2011-2013 it was becoming apparent after yet another mind bending re-shuffle of the workshop with the addition of yet more machinery (larger surface grinder) that Vesper Tools had outgrown the wonderful old shed in its semi rural setting. Time had come to fly the coop, along with the wild ducks that used to hang about while he worked. Not wanting to pay off someone else’s mortgage by renting a factory Chris sacrificed much in life for a factory unit of his own. 2015-2016. Finally in March 2016 Chris was able to get the keys to a dream workshop in an industrial area in south east Melbourne. A filthy and dark concrete dungeon initially requiring a grueling and extensive fitout to transform the place into a clean and bright future proof workshop space Vesper finally re-started production in the new premises on Sept 3rd 2016. 2018. 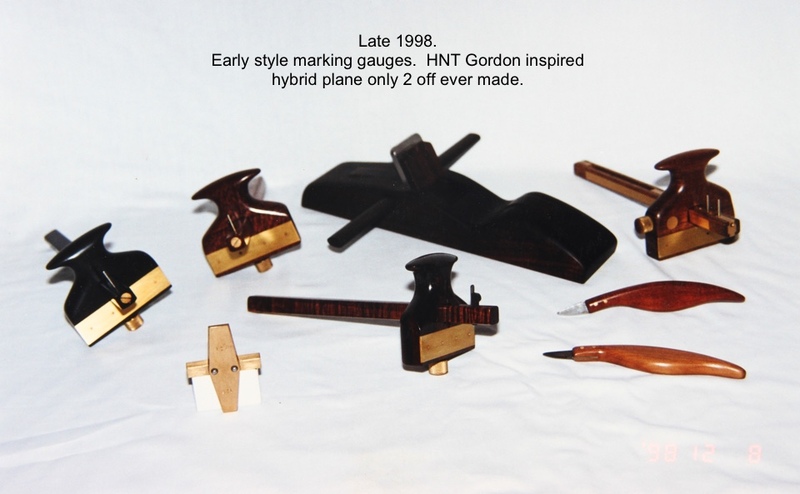 Celebrating 20 years of making and selling the best hand tools possible. The larger industrial building is going well 2 years in with a continuous drive to improve and consolidate layout and equipment. New equipment has been added and upgraded and the extra space is being utilised nicely. There is no capacity for new tools in production as the back log and lack of quality staff remains a problem, as it does for many small businesses that care about craftsmanship and still make things by hand. I welcome you to become part of the Vesper Tools journey and legacy for life. Whether it be one simple knife or a full matched set of sliding bevels or squares I know you will always appreciate the extra effort I put into my work, to make your work so much more enjoyable and productive. My lifetime dedication to my craft I know can be seen and felt in every tool I produce.